ATLANTA – June 4, 2007 – Gamers who visit GameTap.com can now stay to play—for free. The first-of-its-kind broadband entertainment network from Turner Broadcasting System, Inc. (TBS, Inc.) has launched a free-to-play, ad-supported service that is accessible to more players—expanding beyond North America to reach a global audience. GameTap also announced the debut of its digital store, featuring a large library of titles from vintage to brand new. The free service provides access to a rotating sample of GameTap’s library of more than 900 video games, including Metal Slug, Joust, Robotron: 2084, Rampage, Lara Croft Tomb Raider: Legend, Scrapland, King of Fighters, Bust-A-Move, and Space Invaders. Games can be played on a drop-in basis, with even broader access to PC, Dreamcast and Saturn titles for players who register. No credit card or financial commitment is required. Visitors also have free access to hundreds of GameTap TV streaming videos, including interview segments with My Chemical Romance, Akon, Evanescence, Fall Out Boy, and many others. The full-strength, all-you-can-play version of GameTap remains available to subscribers in the United States and Canada with unlimited access to more than 900 games, including GameTap Originals like Sam & Max: Season 1 and Myst Online: Uru Live, as well as GameTap Indies titles and a host of other hits like Panzer Dragoon, Deus Ex, Galaga, Civilization III, and Street Fighter Alpha 3. Paid members can also view GameTap TV’s web-based content and select programs from Cartoon Network/Adult Swim. The service is completely ad-free during game sessions and is available for as low as $6.95 a month. A Mac version will be released later this summer. Today also marks the grand opening of GameTap’s digital online retail store, selling the best video game titles for digital download. With more than 450 titles, the store offers both classic games and new releases – including Lara Croft Tomb Raider: Anniversary, which is available for purchase June 5th, the same day it hits retail shelves. Examples of other titles available for purchase now include Space Empires IV Deluxe, Civilization IV, Psychonauts, and Resident Evil 3. 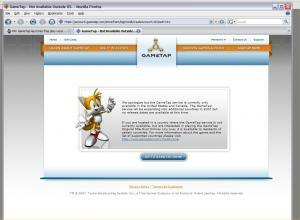 GameTap (GameTap.com), a division of Turner Broadcasting System, Inc., is the leader in digital game distribution and broadband entertainment. Launched in 2005, GameTap delivers more than 900 authentic versions of the greatest console, computer and arcade games, including original and exclusive episodic titles such as Myst Online: Uru Live, Sam & Max: Season 1, Galactic Command - Echo Squad, and American McGee’s Grimm. 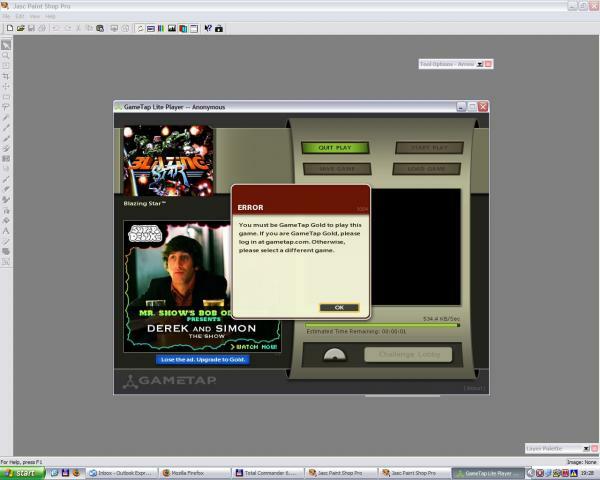 Visitors to GameTap.com can play free games on its ad-supported website, purchase top PC and catalog titles from its digital retail storefront, and tune into GameTap TV’s original programming that includes Retrospective documentaries and new Re\Visioned animated series. GameTap paid members receive unlimited access to its massive library titles, community and multiplayer features, original games, and content. I just managed to download and install the Deluxe player from the website. I have the full interface but still cannot upgrade to gold. Well it's getting better because resolution switching is possible as is playing through controllers/gamepads. Gametap just turned a little sweeter for this Dutchman! My hookup to Gametap is rather limited as I am only able to download the lite-player and run the free games that only require the non configurable lite-player. Account creating and really participating still is not possible, but at least it's something. Wow, it's good to see you're finally getting to tap into GameTap. Are you having problems with the old arcade games on Vista? The sound was distorted pretty badly on mine, at least last time i tried (several months ago). I also need to try to see if my X-Arcade can work with GameTap; I haven't tried it yet, though I did finally get their USB beta tester dongle. Can you imagine how fun it'd be playing all those classic 2-player games (Bubble Bobble, etc.) with the AA regs? Just out of curiosity, do any of you AA'ers live anywhere close to St Cloud, Minnesota? Hmmm, clicking on the green play button does give me the option to download, I can choose between the lite and a more full blown version. What will happen when I try to install? - Well the install does work, but seems to be stuck at more or less 100% completion of the initialization routine, it needs Internet access during the installation procedure. Ok restarting the install made it work. - Clicking the executable made the Gametap Lite player work, but you need to access the games from within the browser by clicking on a 'play link' which will start the player. 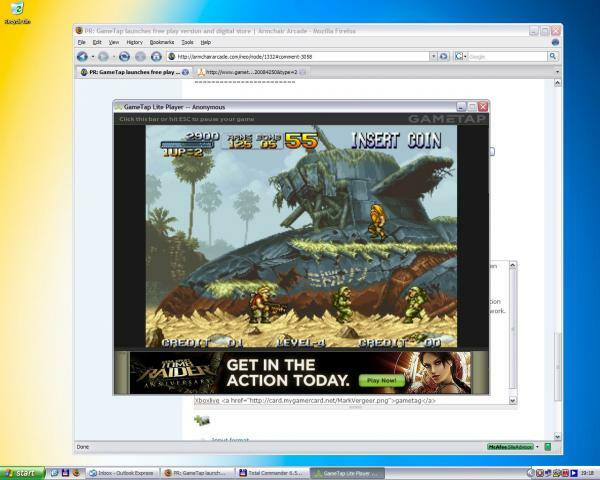 - So GameTap website in browser, click on the play button and YES, the gametap player lite interface initializes, ads load and also Metal Slug is running! It recognizes my Logitech Cordless Rumblepad 2, there's no way to configure controls but it works nice. No full screen possibilities in the lite but hey after all this time I do have GameTap running on my system and I am even able to play Metal Slug for Free! Kudos to GameTap! I would love to become a paying European customer having full access to the service! Trying to play the free Neo Geo Game Blazing Star, resulted in a need to become a gold user, which I cannot become because I cannot create a free account due to the US/Canadian restrictions. New Zealand story (arcade) - yeah! Space Invaders (arcade) - succes! Access is unpredictable from Europe as there's absolutely no way of telling whether a free game will be available or not. But all in all I am a happy camper! Thanks GameTap, but please make access to non US/Canadian citizens a little clearer. Any more news on a time line when access to games will be ready on a more global scale? It sure looks that way! Of course that's only for the rotation-based ad supported line-up, not the full-blown library, but it's certainly a start! Will have to check this out to see if it is true! Gametap for the Dutch?